Your patient satisfaction scores are an important indicator of how well your Emergency Department is performing. However, if many of your most satisfied patients never take the time to fill out a survey (or are admitted to another department instead), you may be left with low scores from patients who had more negative experiences than positive ones. Learn where to make improvements within your department that will help improve your ED’s operations and increase overall patient satisfaction. 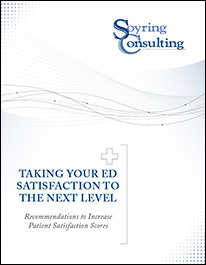 Download today to learn more about patient satisfaction and how your department can improve its operations—ultimately leading to higher scores and better future reimbursements. Soyring Consulting provides managerial and operational consulting services to healthcare facilities of all sizes, including For-profit, Not-for-profit, Community, University, and Faith-based facilities and systems. One of our key areas of focus is Patient Satisfaction.